It's the 1st June, Jubilee month and the theme at the Stamp Man ATC swap is Diamonds for the Queen. My ATC was made with a spritz and dip background using Dusty Concord and Worn Lipstick distress inks. 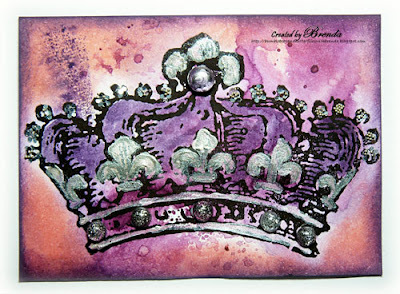 I stamped a Stampendous crown and painted it in with the dusty concord DI and some silver acrylic paint. I added some silver and glittery gems and Beadazzles. I hope you have a wonderful Jubilee weekend if you are in the UK. We are having a 'street party' style get together tomorrow night in a neighbour's garden and having 'high tea' just to be different! We also have a Jubilee picnic where my son lives on Sunday (if the weather holds). Ken and I are having our diamond birthday party in July. Congratulations to our dear Queen Elizabeth for her 60 years reign and many more to come. Have fun wherever you are in the world this weekend. What a brilliant crown, Brenda...hope the weather will be fine on your Sunday picnic...enjoy! Oww that's just gorgeous Brenda ! I wanted to switch off and catch up on friends arty creations. You certainly have a packed weekend planned, hope the sun shines on you. Hello lovely Brenda, I'm so sorry I haven't been over for a while, work got a bit busy with the nice weather!! This ATC is fabulous but then I'm a fan of all your work! Enjoy your parties they sound fab - I'll be working AGAIN! wow, fantastic, beautiful color! have a nice weekend! Fabulous ATC, the crown is gorgeous. Wonderful atc, Brenda, I really like the colors! The celebration sounds fabulous, we've been seeing bits and pieces on the news here. Just wonderful, a fabulous ATC.